In his increasingly chaotic campaign for president, embattled Republican nominee Donald Trump has one issue going for him: trade. Trump has been running successfully against NAFTA, trade with China, and globalization in general. He promises white working-class voters that his version of economic isolationism can restore security and dignity to their lives. Hillary Clinton has struggled to counter him on these points, with Trump attacking her previous support for a new Trans-Pacific Partnership trade deal and her husband’s signing of NAFTA. Trump’s trade rhetoric is powerful, but progressives have a better plan than isolationism. Globalization has had serious impacts on working-class communities—but we need to know which part of globalization we’re talking about. Though Trump often focuses on NAFTA, the volume of trade with Mexico produced by the deal ultimately wasn’t big enough to disrupt the lives of many American workers. What really made the difference was China’s entry into the World Trade Organization. 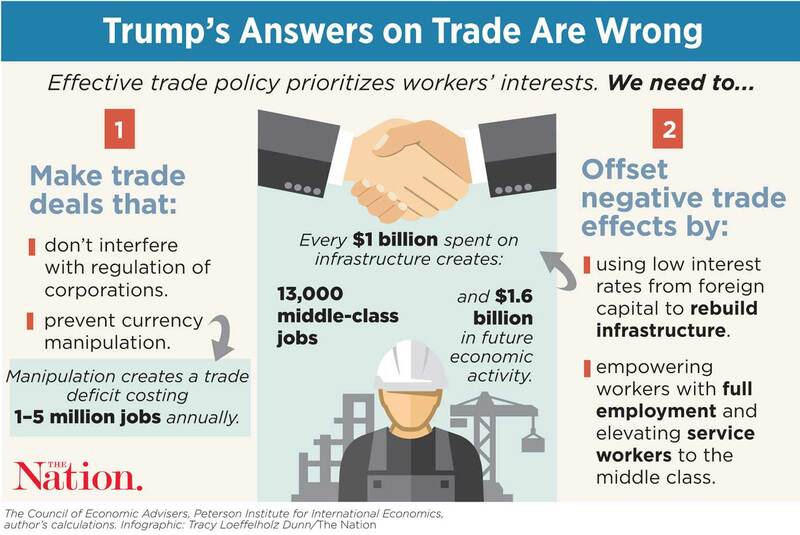 As the economists David Autor, David Dorn, and Gordon Hanson have found, areas that were exposed to the most trade with China faced significant, long-lasting negative consequences for workers. Manufacturing was hit hard, and so were workers outside manufacturing—especially those without a college degree—as these areas lost their economic vitality. Contrary to the optimistic forecasts offered by many economists, workers didn’t magically get jobs in new places and new industries; instead, they faced worse employment prospects and lower wages—if they found jobs at all. Second, we will likely have a trade deficit no matter what we do, because US debt is valuable to many countries as a means of payment and as a protection against financial collapse. If we were to resist that exchange, as Trump suggests, we would destabilize foreign economies and disrupt our own as well. As the economist J.W. Mason notes, we should be focused on channeling this foreign capital into productive investment at home, including job-creating infrastructure that can boost growth. A Green Keynesianism could use the trade deficit to combat global warming while creating good jobs for workers—a win for everyone across the globe.